As a child I remember sitting under the dining table reading books and later listening to my walkman. It was my little escape from a sometimes chaotic house. Even on that thick orange shag carpet it was my little piece of heaven! 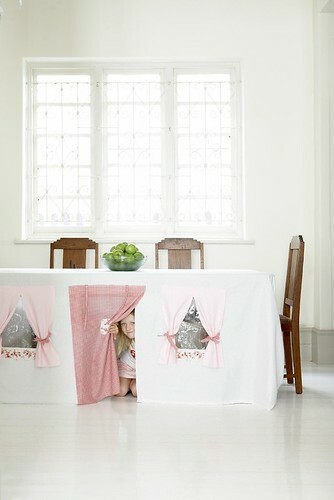 Fast forward about 30 years and the smarties at "Cool Spaces For Kids" on Etsy have created this fabulous dining table tent! Goodness knows if I had this in the 70's I am not sure I would have ever come out. I might just have made one addition...a note on the door that read "No Boys Allowed, Sisters Welcomed"!